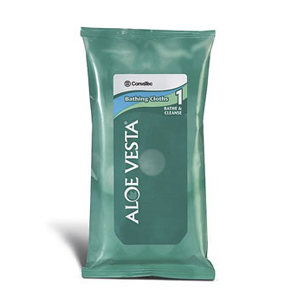 Aloe Vesta Bathing Cloths are a complete no-rinse bathing system. They are thick, soft cloths that contain dimethicone and natural botanical oils to cleanse and moisturize. The Bathing Cloths gently clean without irritating the skin or leaving a soapy residue. Thick, soft, premium-grade, premoistened bathing cloths clean and moisturize essential body parts. Eliminates need for basins and water. Rinse-free cleanser removes debris without irritating skin.